Hey! Já são 6 horas da manhã e já está amanhecendo. É hora de acordar… rsss É hora de levantar da cama, tomar um café e estudar inglês. Isso mesmo! Vamos aproveitar esse horário das 6 da manhã para aprender todas as horas em inglês por extenso das 06:00 às 06:59. Aprenderemos a escrever as horas em diversos formatos para cada minuto em inglês. E para te ajudar a gravar cada uma delas, pelo menos a estrutura de escrita, recomendamos o uso da ferramenta Anki. Se você ainda não tem essa ferramenta, faça o download gratuito aqui. Todas as horas em ponto em inglês, são usadas uma expressão muito comum no dia a dia dos nativos da língua inglesa, “o’clock“. O seu uso é simples… basta apenas escrever os números em inglês de cada hora e acrescentar a expressão logo depois. Vamos ver na tabela de horas em inglês abaixo como usar essa expressão. E depois aprenderemos como escrever as horas em inglês das 06:00 às 06:14. One minute past six One minute past six a.m.
One past six One past six a.m.
Fifty-nine minutes to seven Fifty-nine minutes to seven a.m.
Six one Six one a.m.
Two minutes past six Two minutes past six a.m.
Two past six Two past six a.m.
Fifty-eight minutes to seven Fifty-eight minutes to seven a.m.
Six two Six two a.m.
Three minutes past six Three minutes past six a.m.
Three past six Three past six a.m.
Fifty-seven minutes to seven Fifty-seven minutes to seven a.m.
Six three Six three a.m.
Four minutes past six Four minutes past six a.m.
Four past six Four past six a.m.
Fifty-six minutes to seven Fifty-six minutes to seven a.m.
Six four Six four a.m.
Five minutes past six Five minutes past six a.m.
Five past six Five past six a.m.
Fifty-five minutes to seven Fifty-five minutes to seven a.m.
Six five Six five a.m.
Six minutes past six Six minutes past six a.m.
Six past six Six past six a.m.
Fifty-four minutes to seven Fifty-four minutes to seven a.m.
Six six Six six a.m. Seven minutes past six Seven minutes past six a.m. Seven past six Seven past six a.m.
Fifty-three minutes to seven Fifty-three minutes to seven a.m.
Six seven Six seven a.m. Eight minutes past six Eight minutes past six a.m. Eight past six Eight past six a.m.
Fifty-two minutes to seven Fifty-two minutes to seven a.m.
Six eight Six eight a.m.
Nine minutes past six Nine minutes past six a.m.
Nine past six Nine past six a.m.
Fifty-one minutes to seven Fifty-one minutes to seven a.m.
Six nine Six nine a.m. Ten minutes past six Ten minutes past six a.m. Ten past six Ten past six a.m.
Fifty minutes to seven Fifty minutes to seven a.m.
Six ten Six ten a.m.
Eleven minutes past six Eleven minutes past six a.m.
Eleven past six Eleven past six a.m.
Forty-nine minutes to seven Forty-nine minutes to seven a.m.
Six eleven Six eleven a.m.
Twelve minutes past six Twelve minutes past six a.m.
Twelve past six Twelve past six a.m.
Forty-eight minutes to seven Forty-eight minutes to seven a.m.
Six twelve Six twelve a.m.
Thirteen minutes past six Thirteen minutes past six a.m.
Thirteen past six Thirteen past six a.m.
Forty-seven minutes to seven Forty-seven minutes to seven a.m.
Six thirteen Six thirteen a.m.
Fourteen minutes past six Fourteen minutes past six a.m.
Fourteen past six Fourteen past six a.m.
Forty-six minutes to seven Forty-six minutes to seven a.m.
Six fourteen Six fourteen a.m.
Todos os 15 minutos em inglês passados da hora exata, tem o uso da expressão “a quarter past” (e quinze minutos) para designar que já se passaram 1/4 da hora total. No entanto existem outras formas de escrever, assim como podemos ver na tabela de horas em inglês abaixo. Então vamos seguir e aprender a escrever as horas das 06:15 às 06:29. Fifteen minutes past six Fifteen minutes past six a.m.
Fifteen past six Fifteen past six a.m.
Forty-five minutes to seven Forty-five minutes to seven a.m.
Six fifteen Six fifteen a.m.
A quarter past six A quarter past six a.m.
Sixteen minutes past six Sixteen minutes past six a.m.
Sixteen past six Sixteen past six a.m.
Forty-four minutes to seven Forty-four minutes to seven a.m.
Six sixteen Six sixteen a.m.
Seventeen minutes past six Seventeen minutes past six a.m.
Seventeen past six Seventeen past six a.m.
Forty-three minutes to seven Forty-three minutes to seven a.m.
Six seventeen Six seventeen a.m.
Eighteen minutes past six Eighteen minutes past six a.m.
Eighteen past six Eighteen past six a.m.
Forty-two minutes to seven Forty-two minutes to seven a.m.
Six eighteen Six eighteen a.m.
Nineteen minutes past six Nineteen minutes past six a.m.
Nineteen past six Nineteen past six a.m.
Forty-one minutes to seven Forty-one minutes to seven a.m.
Six nineteen Six nineteen a.m.
Twenty minutes past six Twenty minutes past six a.m.
Twenty past six Twenty past six a.m.
Forty minutes to seven Forty minutes to seven a.m.
Six twenty Six twenty a.m.
Twenty-one minutes past six Twenty-one minutes past six a.m.
Twenty-one past six Twenty-one past six a.m.
Thirty-nine minutes to seven Thirty-nine minutes to seven a.m.
Six twenty-one Six twenty-one a.m.
Twenty-two minutes past six Twenty-two minutes past six a.m.
Twenty-two past six Twenty-two past six a.m.
Thirty-eight minutes to seven Thirty-eight minutes to seven a.m.
Six twenty-two Six twenty-two a.m.
Twenty-three minutes past six Twenty-three minutes past six a.m.
Twenty-three past six Twenty-three past six a.m.
Thirty-seven minutes to seven Thirty-seven minutes to seven a.m.
Six twenty-three Six twenty-three a.m.
Twenty-four minutes past six Twenty-four minutes past six a.m.
Twenty-four past six Twenty-four past six a.m.
Thirty-six minutes to seven Thirty-six minutes to seven a.m.
Six twenty-four Six twenty-four a.m.
Twenty-five minutes past six Twenty-five minutes past six a.m.
Twenty-five past six Twenty-five past six a.m.
Thirty-five minutes to seven Thirty-five minutes to seven a.m.
Six twenty-five Six twenty-five a.m.
Twenty-six minutes past six Twenty-six minutes past six a.m.
Twenty-six past six Twenty-six past six a.m.
Thirty-four minutes to seven Thirty-four minutes to seven a.m.
Six twenty-six Six twenty-six a.m.
Twenty-seven minutes past six Twenty-seven minutes past six a.m.
Twenty-seven past six Twenty-seven past six a.m.
Thirty-three minutes to seven Thirty-three minutes to seven a.m.
Six twenty-seven Six twenty-seven a.m.
Twenty-eight minutes past six Twenty-eight minutes past six a.m.
Twenty-eight past six Twenty-eight past six a.m.
Thirty-two minutes to seven Thirty-two minutes to seven a.m.
Six twenty-eight Six twenty-eight a.m.
Twenty-nine minutes past six Twenty-nine minutes past six a.m.
Twenty-nine past six Twenty-nine past six a.m.
Thirty-one minutes to seven Thirty-one minutes to seven a.m.
Six twenty-nine Six twenty-nine a.m.
Na língua inglesa, os nativos tem o hábito de usar muito a expressão “half past” (e meia) para especificar os 30 minutos em inglês passados da hora exata. No entanto, saiba que essa não é a única forma de escrita. 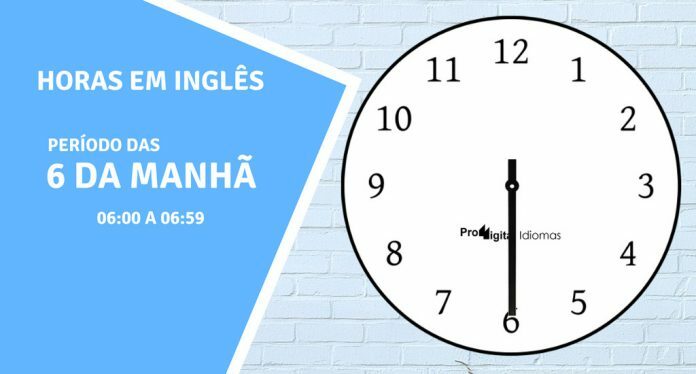 E na tabela de horas em inglês abaixo aprenderemos outras formas de se escrever, e também aprenderemos a escrever as horas das 06:30 às 06:44. Thirty minutes past six Thirty minutes past six a.m.
Thirty past six Thirty past six a.m.
Thirty minutes to seven Thirty minutes to seven a.m.
Six thirty Six thirty a.m.
Half past six Half past six a.m.
Thirty-one minutes past six Thirty-one minutes past six a.m.
Thirty-one past six Thirty-one past six a.m.
Twenty-nine minutes to seven Twenty-nine minutes to seven a.m.
Six thirty-one Six thirty-one a.m.
Thirty-two minutes past six Thirty-two minutes past six a.m.
Thirty-two past six Thirty-two past six a.m.
Twenty-eight minutes to seven Twenty-eight minutes to seven a.m.
Six thirty-two Six thirty-two a.m.
Thirty-three minutes past six Thirty-three minutes past six a.m.
Thirty-three past six Thirty-three past six a.m.
Twenty-seven minutes to seven Twenty-seven minutes to seven a.m.
Six thirty-three Six thirty-three a.m.
Thirty-four minutes past six Thirty-four minutes past six a.m.
Thirty-four past six Thirty-four past six a.m.
Twenty-six minutes to seven Twenty-six minutes to seven a.m.
Six thirty-four Six thirty-four a.m.
Thirty-five minutes past six Thirty-five minutes past six a.m.
Thirty-five past six Thirty-five past six a.m.
Twenty-five minutes to seven Twenty-five minutes to seven a.m.
Six thirty-five Six thirty-five a.m.
Thirty-six minutes past six Thirty-six minutes past six a.m.
Thirty-six past six Thirty-six past six a.m.
Twenty-four minutes to seven Twenty-four minutes to seven a.m.
Six thirty-six Six thirty-six a.m.
Thirty-seven minutes past six Thirty-seven minutes past six a.m.
Thirty-seven past six Thirty-seven past six a.m.
Twenty-three minutes to seven Twenty-three minutes to seven a.m.
Six thirty-seven Six thirty-seven a.m.
Thirty-eight minutes past six Thirty-eight minutes past six a.m.
Thirty-eight past six Thirty-eight past six a.m.
Twenty-two minutes to seven Twenty-two minutes to seven a.m.
Six thirty-eight Six thirty-eight a.m.
Thirty-nine minutes past six Thirty-nine minutes past six a.m.
Thirty-nine past six Thirty-nine past six a.m.
Twenty-one minutes to seven Twenty-one minutes to seven a.m.
Six thirty-nine Six thirty-nine a.m.
Forty minutes past six Forty minutes past six a.m.
Forty past six Forty past six a.m.
Twenty minutes to seven Twenty minutes to seven a.m.
Six forty Six forty a.m.
Forty-one minutes past six Forty-one minutes past six a.m.
Forty-one past six Forty-one past six a.m.
Nineteen minutes to seven Nineteen minutes to seven a.m.
Six forty-one Six forty-one a.m.
Forty-two minutes past six Forty-two minutes past six a.m.
Forty-two past six Forty-two past six a.m.
Eighteen minutes to seven Eighteen minutes to seven a.m.
Six forty-two Six forty-two a.m.
Forty-three minutes past six Forty-three minutes past six a.m.
Forty-three past six Forty-three past six a.m.
Seventeen minutes to seven Seventeen minutes to seven a.m.
Six forty-three Six forty-three a.m.
Forty-four minutes past six Forty-four minutes past six a.m.
Forty-four past six Forty-four past six a.m.
Sixteen minutes to seven Sixteen minutes to seven a.m.
Six forty-four Six forty-four a.m.
Chegado os 45 minutos em inglês, é comum o uso da expressão “a quater to” (quinze para) para dizer que faltam 15 minutos para a próxima hora, no caso 7 horas. Na tabela de horas em inglês abaixo podemos ver como é simples o seu uso. Então vamos seguir adiante e aprender a escrever as horas das 06:45 às 06:59. Forty-five minutes past six Forty-five minutes past six a.m.
Forty-five past six Forty-five past six a.m.
Fifteen minutes to seven Fifteen minutes to seven a.m.
Six forty-five Six forty-five a.m.
A quarter to seven A quarter to seven a.m.
Forty-six minutes past six Forty-six minutes past six a.m.
Forty-six past six Forty-six past six a.m.
Fourteen minutes to seven Fourteen minutes to seven a.m.
Six forty-six Six forty-six a.m.
Forty-seven minutes past six Forty-seven minutes past six a.m.
Forty-seven past six Forty-seven past six a.m.
Thirteen minutes to seven Thirteen minutes to seven a.m.
Six forty-seven Six forty-seven a.m.
Forty-eight minutes past six Forty-eight minutes past six a.m.
Forty-eight past six Forty-eight past six a.m.
Twelve minutes to seven Twelve minutes to seven a.m.
Six forty-eight Six forty-eight a.m.
Forty-nine minutes past six Forty-nine minutes past six a.m.
Forty-nine past six Forty-nine past six a.m.
Eleven minutes to seven Eleven minutes to seven a.m.
Six forty-nine Six forty-nine a.m.
Fifty minutes past six Fifty minutes past six a.m.
Fifty past six Fifty past six a.m. Ten minutes to seven Ten minutes to seven a.m.
Six fifty Six fifty a.m.
Fifty-one minutes past six Fifty-one minutes past six a.m.
Fifty-one past six Fifty-one past six a.m.
Nine minutes to seven Nine minutes to seven a.m.
Six fifty-one Six fifty-one a.m.
Fifty-two minutes past six Fifty-two minutes past six a.m.
Fifty-two past six Fifty-two past six a.m. Eight minutes to seven Eight minutes to seven a.m.
Six fifty-two Six fifty-two a.m.
Fifty-three minutes past six Fifty-three minutes past six a.m.
Fifty-three past six Fifty-three past six a.m. Seven minutes to seven Seven minutes to seven a.m.
Six fifty-three Six fifty-three a.m.
Fifty-four minutes past six Fifty-four minutes past six a.m.
Fifty-four past six Fifty-four past six a.m.
Six minutes to seven Six minutes to seven a.m.
Six fifty-four Six fifty-four a.m.
Fifty-five minutes past six Fifty-five minutes past six a.m.
Fifty-five past six Fifty-five past six a.m.
Five minutes to seven Five minutes to seven a.m.
Six fifty-five Six fifty-five a.m.
Fifty-six minutes past six Fifty-six minutes past six a.m.
Fifty-six past six Fifty-six past six a.m.
Four minutes to seven Four minutes to seven a.m.
Six fifty-six Six fifty-six a.m.
Fifty-seven minutes past six Fifty-seven minutes past six a.m.
Fifty-seven past six Fifty-seven past six a.m.
Three minutes to seven Three minutes to seven a.m.
Six fifty-seven Six fifty-seven a.m.
Fifty-eight minutes past six Fifty-eight minutes past six a.m.
Fifty-eight past six Fifty-eight past six a.m.
Two minutes to seven Two minutes to seven a.m.
Six fifty-eight Six fifty-eight a.m.
Fifty-nine minutes past six Fifty-nine minutes past six a.m.
Fifty-nine past six Fifty-nine past six a.m.
One minute to seven One minute to seven a.m.
Six fifty-nine Six fifty-nine a.m.
E acabamos nossa lição de hoje. Aprendemos as escrever todas as horas em inglês por extenso para o período das 6 da manhã. Nem demorou muito, concorda? Foi o tempo de você tomar um cafezinho. Volte a estudar essa tabela de horas em inglês mais vezes para que você memorize definitivamente todas as formas de escritas. Use a ferramenta Anki para te ajudar nesse processo, OK? Conheça e faça o download da ferramenta aqui.